Medical informatics has expanded rapidly over the past couple of years. After decades of development of information systems designed primarily for physicians and other healthcare managers and professionals, there is an increasing interest in reaching consumers and patients directly through computers and telecommunications systems. Consumer health informatics is the branch of medical informatics that analyses consumers' needs for information; studies and implements methods of making information accessible to consumers; and models and integrates consumers' preferences into medical information systems. Consumer informatics stands at the crossroads of other disciplines, such as nursing informatics, public health, health promotion, health education, library science, and communication science, and is perhaps the most challenging and rapidly expanding field in medical informatics; it is paving the way for health care in the information age. One challenge is to develop or adapt existing computer based decision support systems (expert systems) for use by consumers. Most of these systems were originally developed to provide advice to clinicians about diagnoses or disease management. A recent multisite, randomised controlled trial studied the effect of two decision support systems—Iliad (Applied Medical Informatics, Salt Lake City, UT) and Quick Medical Reference (University of Pittsburgh and Camdat, San Bruno, CA)—on the decision making process of medical students, medical residents, and faculty. The study showed that the magnitude of effects was related to clinical experience: inexperienced users (students) benefited more from the advice than users who had more medical experience.18 These results could be extrapolated to lay people (patients) by hypothesising that such systems would provide the greatest benefit to those with the least previous knowledge (provided that the system could be adapted to their specific needs). This is a strong argument for adapting these systems for consumers. One decision support system that is being adapted and tested for consumers is HouseCall (Applied Medical Informatics), an informatics system derived from the existing physician knowledge base Iliad.19 HouseCall generates a diagnosis based on the user's symptoms and medical history, allows a personal medical history to be noted, and offers easy to read information on a variety of medical topics. Focus group evaluations of HouseCall have shown that the program is easy to use and that consumers like using technology at home to investigate health issues and like participating in solving their medical problems. Obviously, such systems “do not and cannot replace visits with physicians;they can, however, make such encounters more productive, for both doctor and patient.”3 They may also help to triage patients. For consumers, the aim of such support systems would not be to make definitive diagnoses or to propose treatment but to answer simple questions such as “do I need to see a doctor?” or to alert patients to potential drug interactions or other health risks. The main challenge in developing comprehensive systems for consumers is that little is known about how patients interact with computer based informatics tools and how they digest and act on information. Consumer health informatics is designed to empower consumers by putting health information into their hands, including information on their own health, such as diagnoses, lab results, personal risk factors, and prescribed drugs. The European Union's data protection directive (in effect since October 1998) requires all member countries to enact legislation enabling patients to have access to their medical records. One way of facilitating patients' access to their medical records may be through the internet or the adoption of smart cards, or both. The adoption of smart cards was recently announced by the European Union in an initiative which aims to ensure that “all European citizens should have the possibility to have a health smart card to enable secure and confidential access to networked patient information” by 2003.23 Smart cards can be used as places to store health information directly, or the electronic medical record can be put onto the internet and smart cards can serve as keys by providing access. Just as consumers bank online today, they may in future be able to browse and annotate their health records online. Because an electronic record provides a natural base for individually tailored health messages, online records also open new avenues for health education. On the internet it is possible to link personal information to external resources such as glossaries, websites, and databases such as Medline. For example, if the doctor's list of diagnoses or suggested changes to the patient's lifestyle contains the word “smoking,” links can automatically refer the patient to health promotion sites that advise people on how to quit. Future technological advances may bring this kind of information to mobile phones, hand held computers, personal digital assistants, and wearable computers. In the United States, several projects are under way to evaluate the use of internet based health records that are accessible to patients. For example, a system called SeniorMed gives elderly patients access to their medication lists through the internet.26 Another company, MedicaLogic (www.medicalogic.com), is also testing internet based health records (www.98point6.com and www.aboutmyhealth.net). These records are embedded in an information system that lets users search for information on health conditions, order refills for prescriptions, and communicate with their physician's office. Computer based applications are being developed to help clinicians integrate a patient's preferences (values) with scientific evidence, the patient's history, and local constraints. These systems also help patients make choices for treatment or screening on the basis of their preferences for different outcomes. Such decision aids, which can be used by patients with or without healthcare professionals, are especially desirable when the optimal management strategy depends on the strength of the patient's preferences for the different health outcomes that may result from the decision.27 For example, a decision system for contraceptives choice would not only take into account personal risk factors (such as smoking) to determine the best choice but also determine the values the patient places on different outcomes, such as unwanted pregnancy or venous thrombosis. 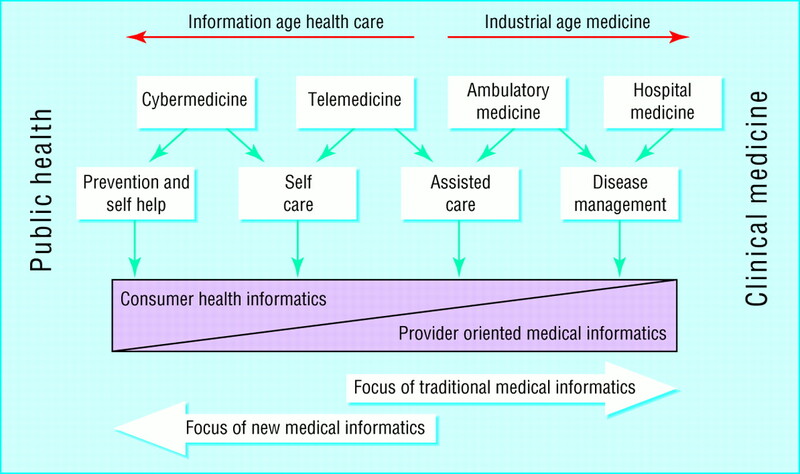 Consumer health informatics is not restricted to the use of computers and telecommunications but also includes the delivery of information to patients through other media: the theoretical framework of consumer informatics, for example the analysis of their information needs, is independent of the media through which the information is presented. The computer is not always the most effective medium for delivering information. Studying the effects of these systems on public health, the patient-professional relationship, and society. The internet is a vast resource, but to realise its full potential it is necessary to direct consumers to high quality information and to teach them how to assess the quality of information. The quality control of health information on the internet rests on four pillars: educating the consumer, encouraging the self regulation of providers of health information, having third parties evaluate the information, and enforcing sanctions in cases of dissemination of fraudulent or harmful information. Considerable progress has been made in all four fields. An ongoing European Union project, the MedPICS Certification and Rating of Trustworthy Health Information on the Net (medCERTAIN; www.medpics.org/medcertain/), is based on the idea that the quality of health information and interactive applications on the internet should not be controlled by a central body or authority but instead must be evaluated and labelled (associated with meta-information) by medical societies, professionals, or consumer organisations.29–32 The project is developing a technical infrastructure to allow individuals, organisations, associations, societies, and other entities to rate the published health information found online by using a standardised vocabulary. The medCERTAIN consortium will also create different levels of certification for those who publish health information on the internet; these will range from a simple rating of “good standing” to “gold seals” indicating that the site has been externally peer reviewed. Although the information society offers tremendous potential for reducing the knowledge gap between professionals and patients, it also brings a risk of a widening of the gap between those who have access to new technology and those who have been excluded.36 Bridging this digital divide and bringing consumer health informatics to groups that have the greatest need will be particularly challenging. In the industrial age, the inverse care law described the idea that the availability of good medical care tends to vary inversely with the need for medical care in the population served.37 In the information age, we face an analogous “inverse information law”—that is, access to appropriate information is particularly difficult for those who need it most. The vicious circle of low education and low health literacy and low income, poor health, and the inaccessibility of information technology, can only be broken if the field is not left to market forces alone but if public health policy actively brings information technology to those who are underserved. In 1990, Shortliffe and Perrault wrote that for health professionals “it is increasingly difficult to practice modern medicine without information technologies”—a statement that is more true than ever today.5 However, these days there is an additional trend: it is also increasingly unlikely that health professionals will encounter patients who have not used information technology to influence their health knowledge, health behaviour, perception of symptoms, and illness behaviour. Health professionals should, therefore, not only understand consumer health applications but also ensure that these applications are developed, applied, and evaluated properly. The greatest contribution of consumer health informatics research to thehealthcare sector may eventually be found in its attempts to systematise and codify consumers' needs, values, and preferences; in its research into how information is digested and is best presented to consumers; and in its research into how these variables influence outcome measures. Thus, current health informatics research may have greater implications for the practice of medicine than medical informatics ever did before. The author benefited from discussions about the definition of “consumer health informatics” with members of the American Medical Informatics Association Working Group on Consumer Health Informatics at the their autumn symposium, in 1999 in Washington, DC, most notably Alex Jadad and Betty L Chang. Competing interests GE receives fees from consumer health websites for speaking and consultant work.
. Medical informatics. An emerging academic discipline and institutional priority. JAMA 1990; 263: 1114–1120.
. Medical informatics: computer applications in health care. Reading, MA: Addison-Wesley, 1990.
. Handbook of medical informatics. Heidelberg: Springer, 1997.
. Paternalism or partnership? Patients have grown up—and there's no going back. BMJ 1999; 319: 719–720.
. Shopping around the internet today and tomorrow: towards the millennium of cybermedicine. BMJ 1999; 319 (13 Nov). Full version:www.bmj.com/cgi/content/full/319/7220/1294 (accessed 31 May 2000).
. Promoting partnerships: challenges for the internet age. BMJ 1999; 319: 761–764.
. The future of healthcare systems. BMJ 1997; 314: 1495–1496.
. Evaluation of cyberdocs. Lancet 1998; 352: 1526.
. Cybermedicine [letter]. N Engl J Med 1998; 339: 638–639.
. NHS direct: evaluate, integrate, or bust. BMJ 1998; 317: 1026–1027.
. Matching demand and supply fairly and efficiently. BMJ 1998; 316: 1665–1667.
. Rating health information on the Internet: navigating to knowledge or to Babel? JAMA 1998; 279: 611–614.
. The NHS's new information strategy. BMJ 1998; 317: 900.
. Health online and the empowered medical consumer. Jt Comm J Qual Improv 1997; 23: 251–257.
. Enhancement of clinicians' diagnostic reasoning by computer-based consultation: a multisite study of 2 systems. JAMA 1999; 282: 1851–1856.
. Consumer health informatics: knowledge engineering and evaluation studies of medical HouseCall. Proc AMIA Symp 1998: 612–6.
. Why patients should keep their own records. J Med Ethics 1984; 10: 27–28.
. Giving patients their own records in general practice: experience of patients and staff. BMJ 1986; 292: 596–598.
. Medical records: practicalities and principles of patient possession. J Med Ethics 1991; 17: 138–143.
. Communication on a commission initiative for the special European Council of Lisbon, 23 and 24 March 2000. http://europe.eu.int/comm/information_society/eeurope/pdf/com081299_en.pdf (accessed 30 March 2000).
. Randomised trial of personalised computer based information for cancer patients. BMJ 1999; 319: 1241–1247.
. Tailoring health messages. Customizing communication with computer technology. London: Lawrence Earlbaum Associates, 2000.
. SeniorMed: connecting patients to their medication records. Proc AMIA Symp 1999: 1147.
. Involving patients in medical decisions: how can physicians do better? JAMA 1999; 282: 2356–2357.
. Improving health care by understanding patient preferences: the role of computer technology. J Am Med Inform Assoc 1998; 5: 257–262.
. Towards quality management of medical information on the internet: evaluation, labelling, and filtering of information. BMJ. 1998; 317: 1496–1500.
. Labeling and filtering of medical information on the Internet. Methods Inf Med 1999; 38: 80–88.
. Helping patients access high quality health information. BMJ 1999; 319: 764–766.
. DISCERN: an instrument for judging the quality of written consumer health information on treatment choices. J Epidemiol Community Health 1999; 53: 105–111.
. e-Health ethics draft code. J Med Internet Res 2000; 2: e2.www.symposion.com/jmir/2000/1/e2/ (accessed 2 Apr 2000).
. Falling through the net: defining the digital divide. A report on the telecommunications and information technology gap in America. Washington, DC: National Telecommunications and Information Administration, US Dept of Commerce, 1999.
. The inverse care law. Lancet 1971; i: 405–412.